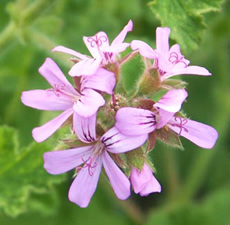 Traditional Use: Throughout history geranium has been known as a powerful wound healer. It has been utilized medicinally and in the fragrance industry. Properties: Analgesic, antibacterial, antidepressant, antidiabetic, anti-inflammatory, antiseptic, astringent, cicatrizant, deodorant, diuretic, emmenagogue, hepatic, insecticide, regenerative, rubefacient, sedative, styptic, tonic, vasoconstrictor, vermifuge, vulnerary Benefits: Acne, anxiety, broken capillaries, bruises, burns, circulatory disorders, cuts, cystitis, depression, dermatitis, diabetes, diarrhea, eczema, fluid retention, hemorrhoids, herpes, insect bites, lymphatic congestion, menopause, neuralgia, ringworm, shingles, sore throats, stabilize emotions, tonsillitis, ulcers, wounds. The antidepressant and emotional stabilizing effects of this oil can be used in many ways. Diffuse into the air, or make a room spray that you can spray as needed. You can also add the oil to a full, hand, or foot bath. Of Interest: Geranium leaves can be used in jams and jellies. The oil can be used in baking. A couple of drops may be added while making sugar cookies. The aroma fills the house while you are baking and adds flavor to the cookies.